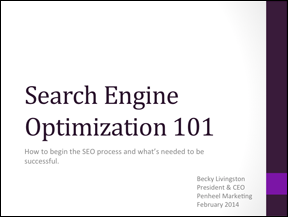 In this slide deck, we talk about how to begin the search engine optimization (SEO) process, and what’s needed to be successful about using it. The presentation begins with an overview of what SEO is, compared to perhaps, search engine marketing (SEM), which many people get confused. SEO is the “organic” way people search for content, while SEM is the paid advertising or marketing that’s done online. What do crawlers find important? Who is leading the search engine market share? Long- and short-tail keyword examples. Process cycle for getting all this done. Interested in learning more? Download this slide deck today. What are you looking to learn about search engine optimization?